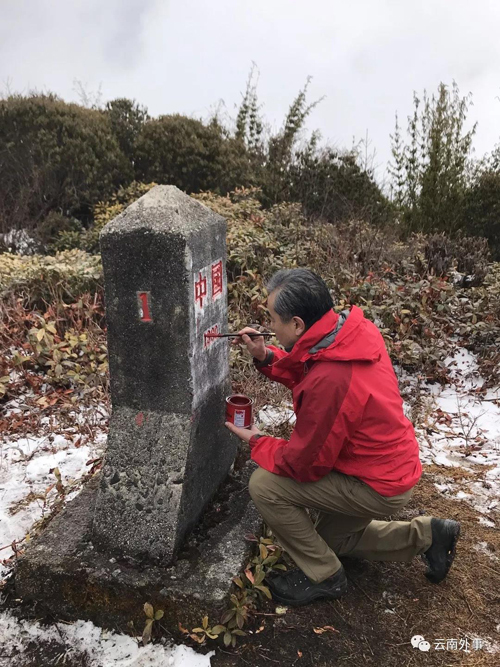 On February 17, 2019, on the occasion of the 70th anniversary of the founding of the People's Republic of China (PRC), State Councilor and Foreign Minister Wang Yi walked along the border line to make a hiking inspection to the China-Myanmar border and inspect the first boundary monument of the PRC. The China-Myanmar border is the first demarcated border between China and its neighboring countries after the founding of the PRC. The China-Myanmar demarcated border in 1960 set a precedent for the peaceful and friendly settlement of the border issue between the PRC and its neighbors, and consolidated and deepened the traditional "Paukphaw" friendship between the peoples of China and Myanmar. The boundary pile No. 1 between China and Myanmar, known as Monument No. 1 of the PRC, is located in Tengchong, Baoshan City of Yunnan Province. 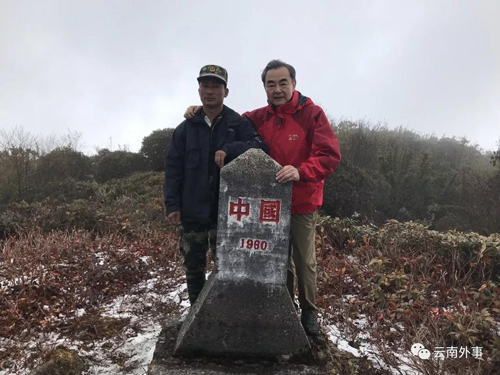 Wang Yi and his delegation set out on foot from the pass in the stone city, braved heavy snow and wind, and inspected the border line between China and Myanmar in the ridge and gorge above 2,900 meters above sea level until they reached the China-Myanmar No. 1 boundary pile, which is located at the main peak of the Jiangao Mountain at 3,214 meters above sea level. Wang Yi carefully examined the preservation of the first boundary monument of the PRC, and personally added color to the slightly-mottled red Chinese characters for "China" on the monument. Wang Yi learned from the local staff for boundary affairs about the daily maintenance of the border, and expressed greetings and gratitude to the grass-root staff of boundary affairs. Deputy Secretary-General of the State Council Peng Shujie, Vice Governor of Yunnan Province Zhang Guohua, Director-General of the Department of Boundary and Ocean Affairs of the Foreign Ministry Yi Xianliang, and Director of the Foreign Affairs Office of Yunnan Province Li Jiming participated in the event.